On Thursday, Sheena went to Austin, TX for a work related event. Layla and I decided that it’d be fun to meet Sheena up there and make a weekend of it. So we had 2 options. 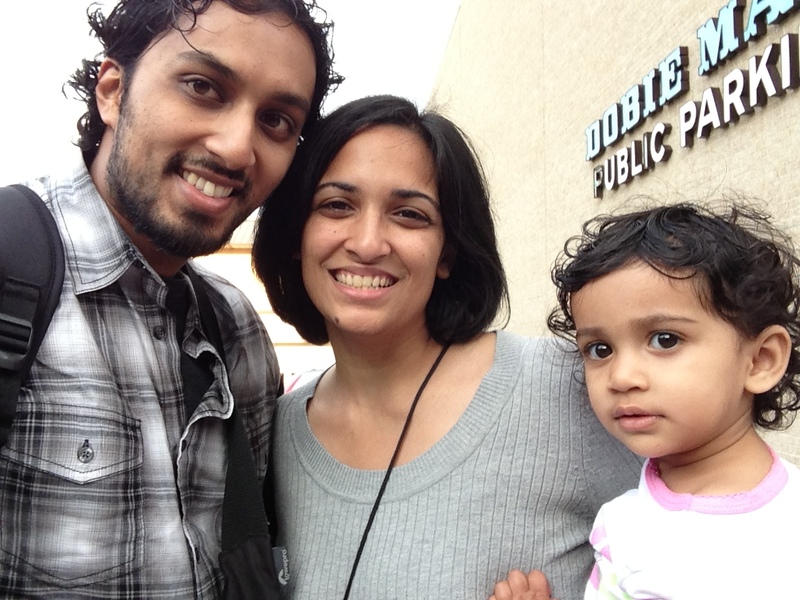 Option 1: Layla and I drive up to Austin after work on Friday and meet up with Sheena. Cons to Option 1: We’d have 2 of our cars up in Austin, meaning 2x the gas and we would have to follow each other home rather than ride in the same car. Plus a 3 hours drive with a 1 year old strapped to a car seat isn’t the most pleasant thing to do. Driving would probably cost me roughly $100 in gas, so I figured that if I get a plane ticket for a little more than that, it’d still be worth it… so I started looking. My first search found tickets for $161. That’s not too bad, but lets see if it drops a little over time… Next time I check, it was $183! Ohh snap! it went higher… but maybe it’ll go lower closer to the travel date… right? WRONG, it went higher to $193! Option 1 started to look a lot better. A magical 3rd option emerged. 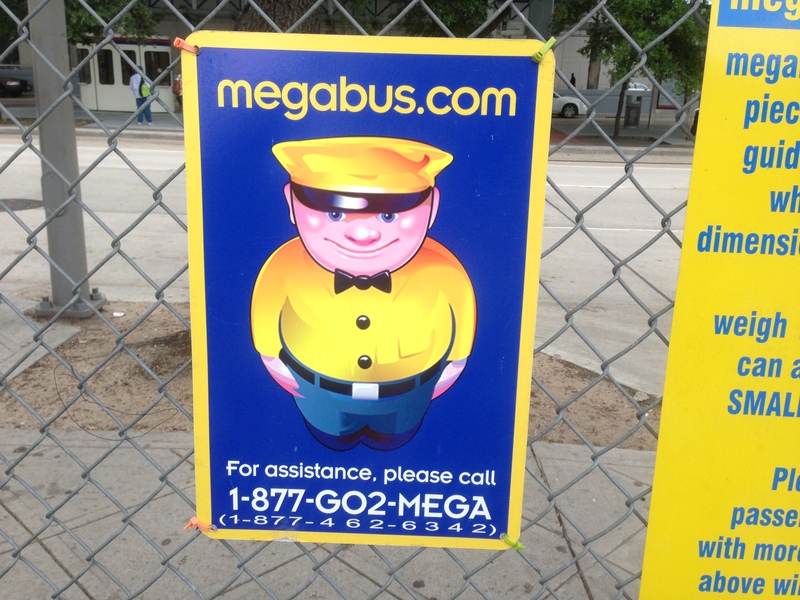 It dawned on me to check out Megabus. 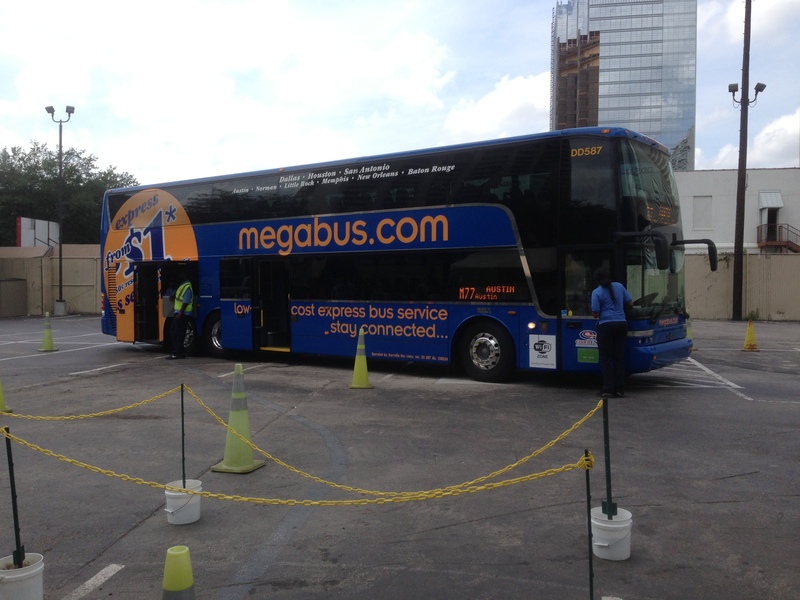 Some friends used Megabus for a Houston to Dallas trip and mentioned that it wasn’t too bad. So I jumped on the site. They have numerous Houston to Austin trips. 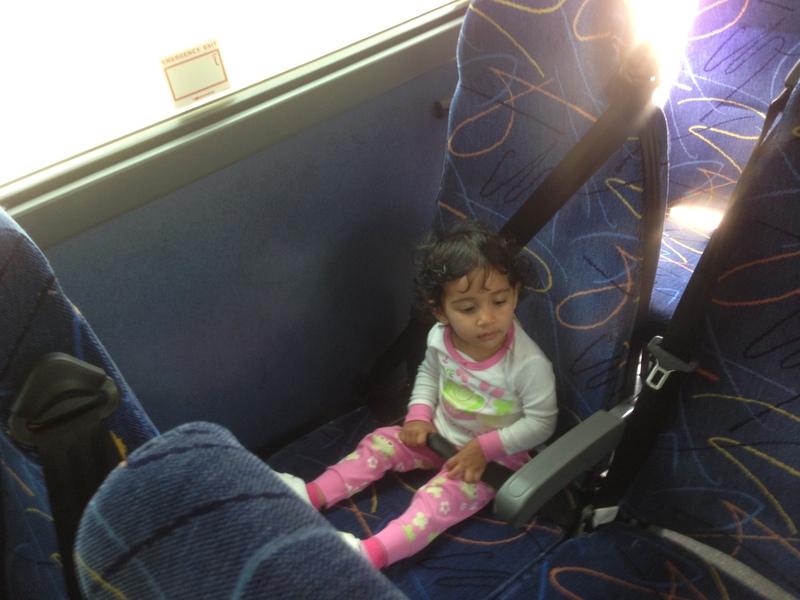 I had to buy a ticket for Layla as well, but in total, we spend $32.50 for the 2 of us on a one way bus to ATX! The price was right… the pick up and drop off locations were reasonable… So we went for it! 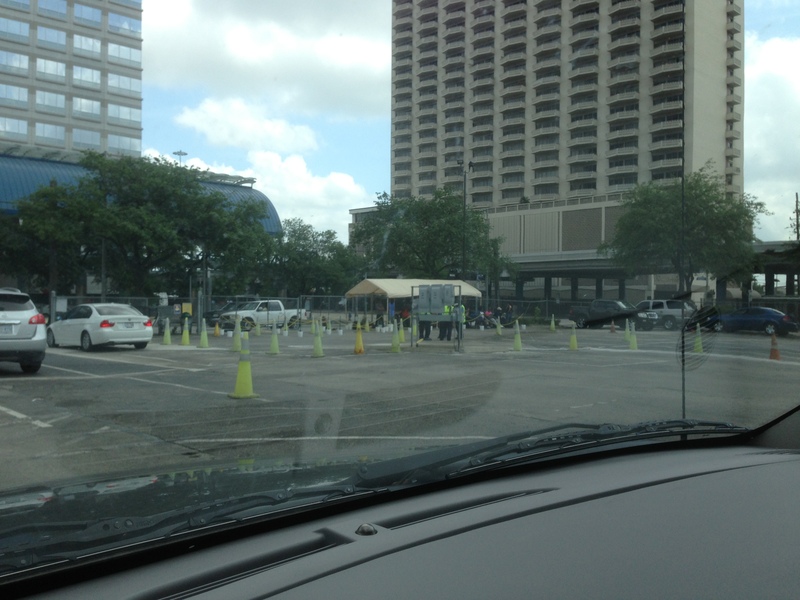 The pick up point in Houston is in Downtown (815 Pierce St. – across from the Metro Transit Center). I took a half day at work and luckily my friend/neighbor Benson was free to drop us off. The bus itself was really nice! It was a double decker with comfortable seats. My biggest worry was keeping Layla occupied. It’s 3 hours on a bus. No matter how comfortable it is, 3 hours is a long time for a 1 year old. So I came equipped with food, iPad, iPhone, toys and books. Although I wanted to sit on the upper deck, the restroom was on the first floor, so in case of a baby emergency, I figured it’d be good to be close by. Layla settled in nicely. 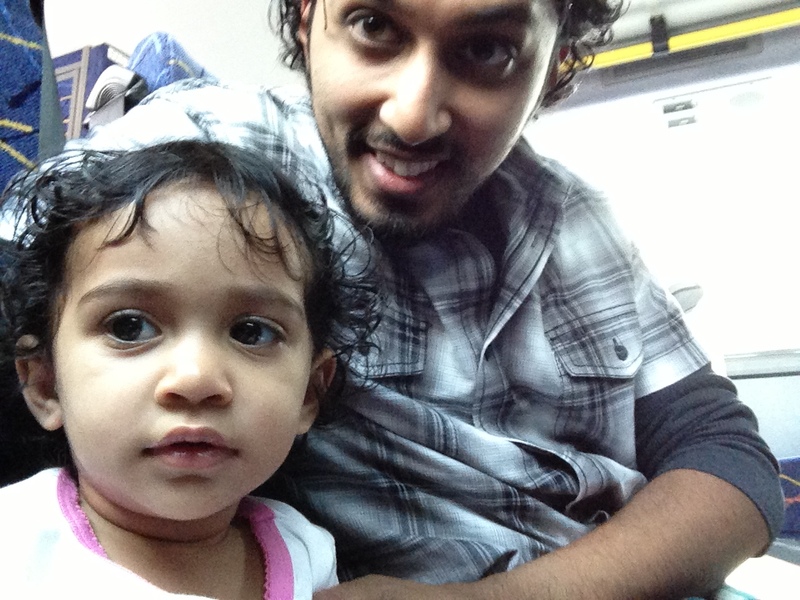 Before the bus even moved, Layla opened up her backpack and started reading her books. We had 2 stops in between. One at a Shell Gas Station at FM 1960 and 290. The other in Prarie View A&M. Both stops didn’t take too long at all. Layla woke up a few times and I thought it’d be a good idea to feed her when I could. She didn’t have much of an appetite, but she did eat some fruit snacks. When we were about 1 hour away, she was up again, and we had books out, the iPad out, stickers… the works. Then Layla looked at me and threw up a lil. I quickly pointed her to the aisle cause… well, I didn’t want to get thrown up on! It wasn’t too bad. Since I was close to the restroom, I was able to clean her up quickly and then clean up the mess quickly as well. The bottom deck wasn’t too packed, so it didn’t really affect any of the other riders… but I still felt kinda bad. Other than that one bump in the road, the trip itself was awesome! The drop-off point in Austin is right outside of Dobie Center (Whitis Ave between W 20th and W 21st). Sheena was in the area catching up with her old friend, Lance and to scoop us up. Layla saw Sheena across the street and was smiling from ear to ear (smile not shown below)! Overall, Megabus rocked! It was a lil tough for me to haul all of Layla’s gear plus my luggage by myself, but we made it work. As far as travel times, it left on time and would have made it on time to Austin if it weren’t for traffic. 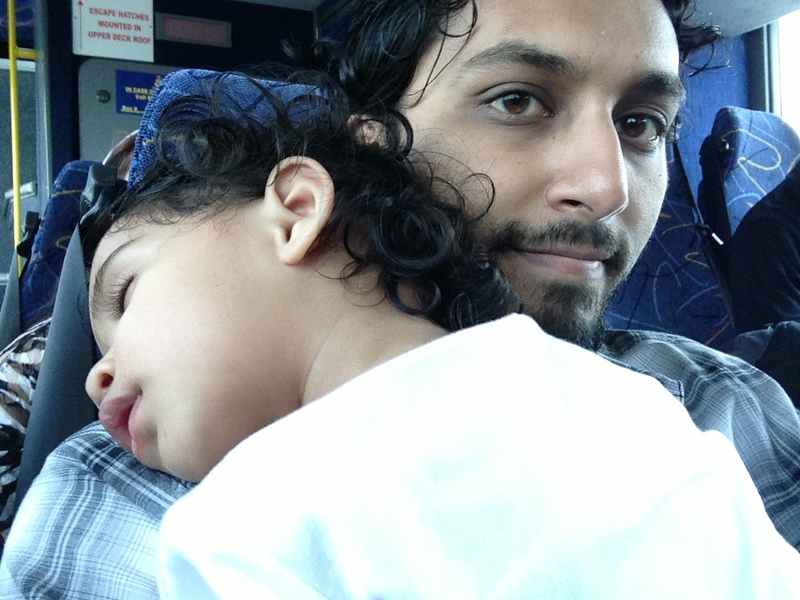 Can’t really blame Megabus for traffic, so I would say it “ran on time”. 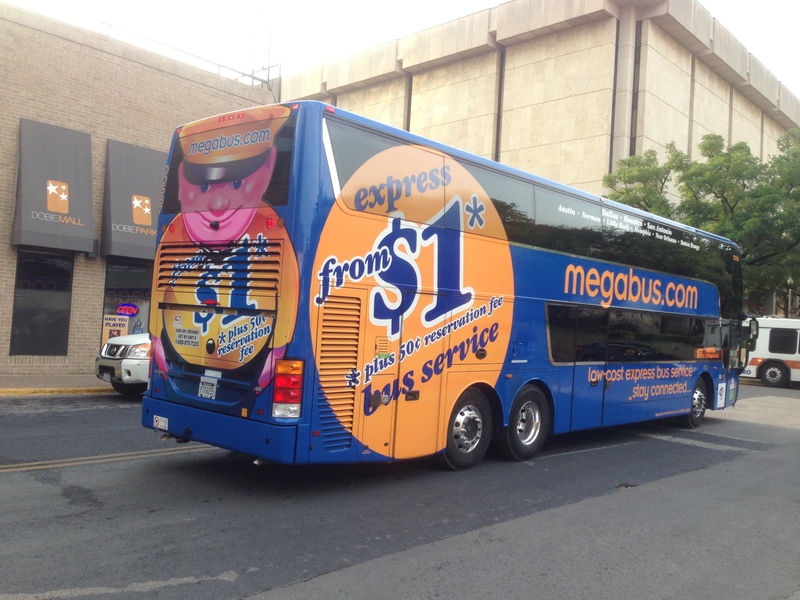 I think Megabus is perfect for college students or people making quick trips to visit friends in Austin (or really anywhere else Megabus travels to). It’s a cheap and comfortable alternative to flying or driving by yourself. If you haven’t already checked it out, DO IT!